I love the concept of psychic detectives (perhaps more along the lines of 2000AD's Judge Anderson than the BBC's Jonathan Creek). That odd, isolated and strange character that is nevertheless vitally important to many investigations. The specialists with glowing eyes, non-standard interrogation techniques, and the ability to force blast crims out of the way. Every sci-fi cop department could use one! Psy-Ops are regularly employed to track down rogue psykers by following psychic signatures. 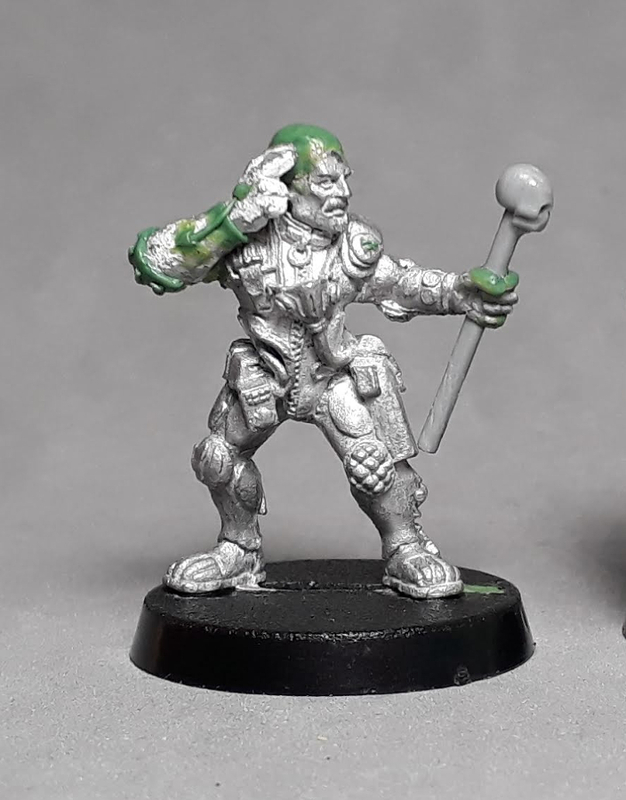 I made the sanctioned psyker from an old Van Saar leader. I removed his right pistol arm and replaced it with an arm from an old Marauder chaos thug with bow. His chainsword was replaced with a banner pole from an old plastic space marine bike to represent a force rod. I also enlarged his cranium and added a Lobot-style psychic hood, as well as details on the right arm and tidying up a few areas. I haven't yet thought of a name yet, although 'Judge Mental' was suggested by theottovonbismark, and I can't shake it off! I wanted to keep the same colour palette as the rest of the Adeptus Arbites, but decided to give him a sinister black bodysuit, rather than copy the grey armour. Blue accents and grey pouches tie him to the rest of the Arbites. I painted him mid-psyching(sp? ), with a blue glow around his eyes, force rod and psychic nodes on his suit. a grenade launcher with scare grenades as some kind of long-ranged fear type power. smoke grenades as a short-ranged concealment type power. I could add in further 'powers' later by giving him a bio-scanner (psychic detection) or stimm-slug stash (psychic boost). I'm sure there's plenty of other off-beat gear he could use! 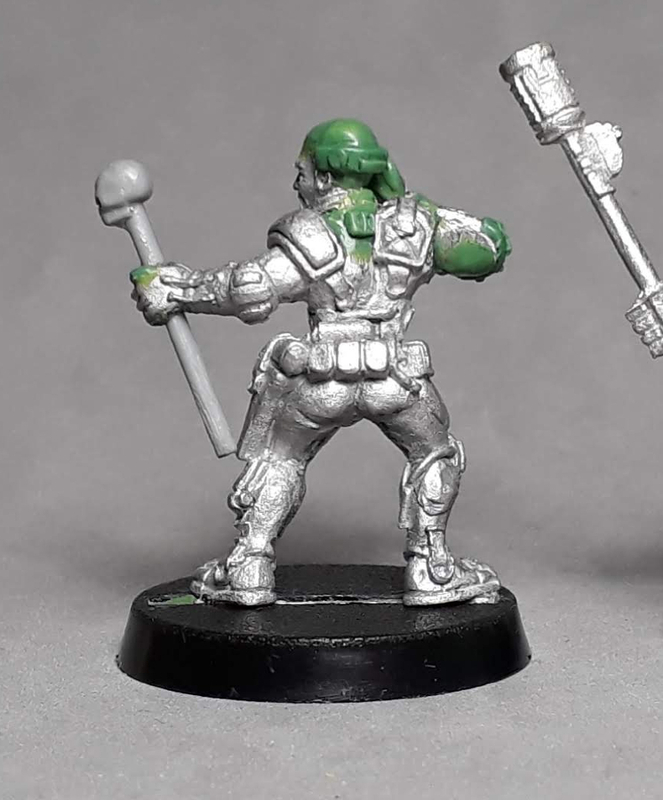 Excellent re-purposing of an existing miniature, shows the effectiveness of a simple conversion to turn the mini into a unique and eye-catching special character. Also, nice use of conventional gear as "counts as" psionic powers. It didn't take much to adapt him really - a few tweaks and a bald head! I'm hoping that you'll be able to add psykers to gangs at a future point, but for now he'll just have to keep rocking up with his 'counts as' gear. I don't know if there's even background fluff for psykers in the Arbites. I read the Shira Culpurnia novels about a year ago, but I don't recall a Judge Anderson type, just them being twitchy and trigger-happy around even sanctioned psykers! I've read the Culpurnia books too, and I can't remember either! It's not outwith the realms of possibility though. Great conversion. I have a spare one of these lying around - good to have some inspiration about how to use it. I'd also vote for Judge Mental! Thanks! I'd be interested to see your take on your spare leader. I think with some extra gear he'd make a cool bounty hunter, or perhaps with a tool kit he could be a tech? Brilliant, he's totally Judge mental. He's not going to escape that nick name is he?!! I love this conversion. He's a brilliant character. I actually prefer him using smoke grenades and drugs to pretend he has powers. 'Pick a card, any card!' he screams while his comrades roll their eyes. Does this mean we're going out now? Ha! So the psyker stuff is all just an act realised through trickery and sleight of hand? That sounds like fun! I think it makes it fun if he's not actually a psyker. Sweet. Pick me up at 7? Perhaps I should call him an Adeptus Arbites illusionist. Or charlatan maybe?! Judge Mental - I love it! That is an excellent conversion! Just enough change to effectively convey what he is about, while building on an excellent vintage figure. I might have put on a few purity seals though, just to show he's "authorized". As an aside, I appreciate your consistently showing us the green phase of your conversions. Too many show only the final work, and figuring out what was added/deleted can be very challenging. I like seeing other folks WIP stuff too, so I think it's useful to show mine. I had never thought of this concept, and now I find it essential for any Arbites force. Dammit, now I need one! This is corking. I get a real "Psi-Ops: Mindgate Conspiracy" vibe from this guy, as he's lacking the standard space-wizard design tropes of most 40K Psykers like the Primaris Psyker, and looks like even without the mind powers he would come out on top. Thanks very much. Glad you like him! Beautifully done! I really dig how that turned out!